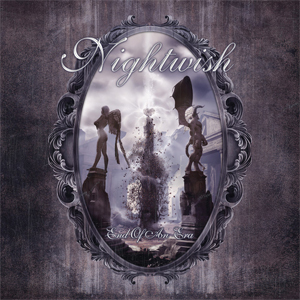 October 21st, 2005 is a historic date for every NIGHTWISH fan – many tears flowed, yet the foundation was laid for a new beginning and the ongoing continuity of the band. 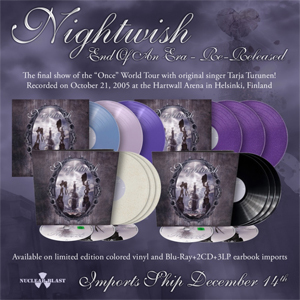 What subsequently appeared as the DVD titled End Of An Era was not only the final show of their mega-selling Once tour, but also the very last joint performance with their singer Tarja Turunen. Due to all of these facets and more, the DVD will give you goose bumps many times over, yet it crowns the end of the Tarja chapter with a unique show that could hardly have been better or more spectacular. The setlist is stunning and contains 18 hymns, such as the opening "Dark Chest Of Wonders", "Sleeping Sun", "Nemo" and "Bless The Child" through to the final "Wish I Had An Angel". If you do not already own this live masterpiece, you can now look forward to the extensive new edition. On December 7th End Of An Era will be re-released as 3LP and Earbook formats including BluRay, 2CD and 3LP.